True Advantage High Risk Nitrile Exam Gloves are our highest quality first-aid gloves. 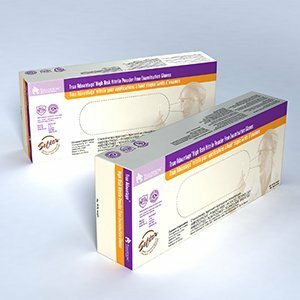 They are non-latex powder-free exam nitrile gloves with polyglide lining, and meet NFPA standards and are chemotherapy approved. Manufactured using a patented non-sulfur based curing process which connects the polymer molecules when compared to the curing methods of other nitrile gloves. This allows the polymer more freedom of movement, allowing the glove to conform to the hand rather than constrict it. These textured gloves have beaded cuffs and a thickness of 6.7 mil.